Larissa Williams leading an INBRE funded Short Term course at the Mt. Desert Island Biological Laboratories in 2013. The Biology curriculum covers all levels of biological organization from molecules to ecosystems. Majors actively learn biology in innovative classroom, laboratory, and field settings, and special emphasis is placed on development of sound critical thinking and research skills. 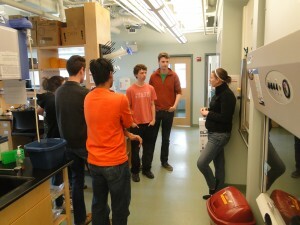 The major’s core courses laboratories (Bio 190, 242, and 270) focus on science as a process and journal-style scientific writing – a collaborative group pedagogy in which students learn biology by practicing the process of scientific inquiry through investigative laboratory and field experiences and intensive W2-level writing training. Elective courses at the upper levels provide focused training at all levels of biological organization. Biology seniors also complete a required capstone experience which may include thesis or service learning projects. In recent years we have graduated approximately 50-70 majors per year in Biology and its related disciplines, a majority of whom go on to graduate and professional schools within five years of graduation.